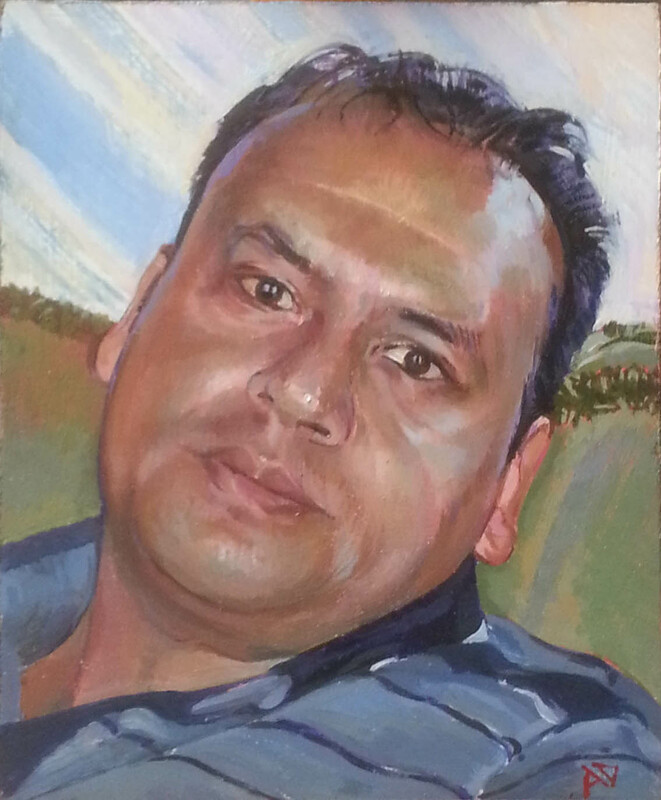 This is a recently completed portrait of a man from Bangladesh, called Abdul painted by Alan Dedman. The painting is in oils over acrylic on board, A6 size – 10.5 cm x 14.8 cm. This is a small artwork, based on photo reference and sketches. Abdul came to sit for me at my studio, during the time he was there we got to know each other a little which is important for putting the best into the process; sketching allowed me to see aspects of Abdul’s appearance that I wouldn’t have, had I only used a camera. Drawing allows me to note critical aspects about the topography and idiosyncrasies of a person’s face. In this instance the sitters eyebrows and lips hint at Oriental and Moorish head structure. Sketches help me to characterise a portrait. Painting the colours apparent in Asian skin was a new experience, although we drew Afro-Caribbean models at the Royal Academy Schools, I never painted them. In this case I used Winsor and Newton artist’s acrylic colours to hasten the underpainting; finishing with Roberson’s oil colours. Roberson’s oil colours contain a high percentage of linseed oil and therefore dry quickly compared to cheaper products which contain more poppy oil. I used very small brushes, 1, 0 and 00 with a straight oils technique. Initially I wore reading glasses to help me focus on the surface but decided they were in fact weakening my eyes and abandoned using them. I like the challenge of working on a micro scale for a change, but have always done small works like this as informal cameos or sketches. It concentrates your mind and is in stark contrast to the larger, crazier paintings I make. Painting on a small scale also reduces materials expenditure. With India as neighbour, Bangladesh has a rich cultural background. Abdul is the proprietor of an Indian take-away. He cooks for his business but tells me his wife is better at it than him. Many Bangladeshi dishes are sea-food based because of the country’s coast and large river delta. Try Morag – polao or Vuna Kichuri for traditional chicken/meat dishes from Bangladesh. Scroll down past the social media buttons if you wish to contact Alan Dedman via the comments form on this blog.